The Sun Icon and Wave Fountain at Sunshine Plaza were part of the original park design when Disney California Adventure opened in February 2002. In 2010 they were both retired as construction began on the new Carthay Circle Theatre. Also gone after the expansion were Greetings From California & the California Zephyr. The Sun Icon & Wave Fountain were mostly used by guests as a photo stop, rest spot and seating area for parades. 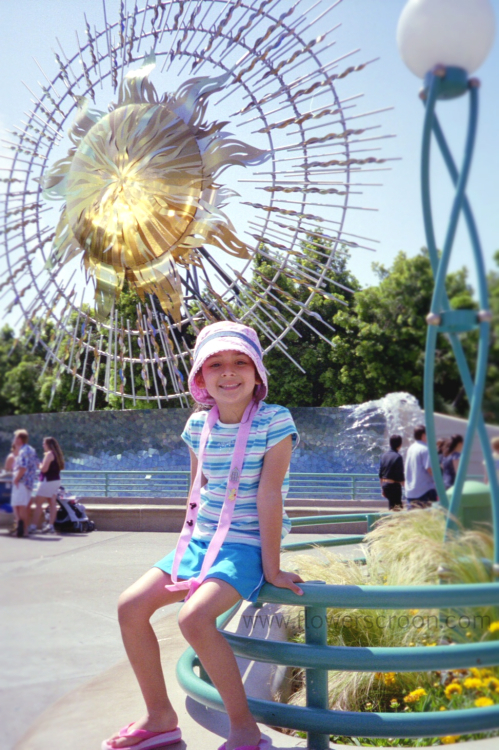 I love this beautiful old photo of my daughter in Sunshine Plaza, but I don't miss the Sun Icon as much as I love Buena Vista Street & Carthay Circle meals and martinis.